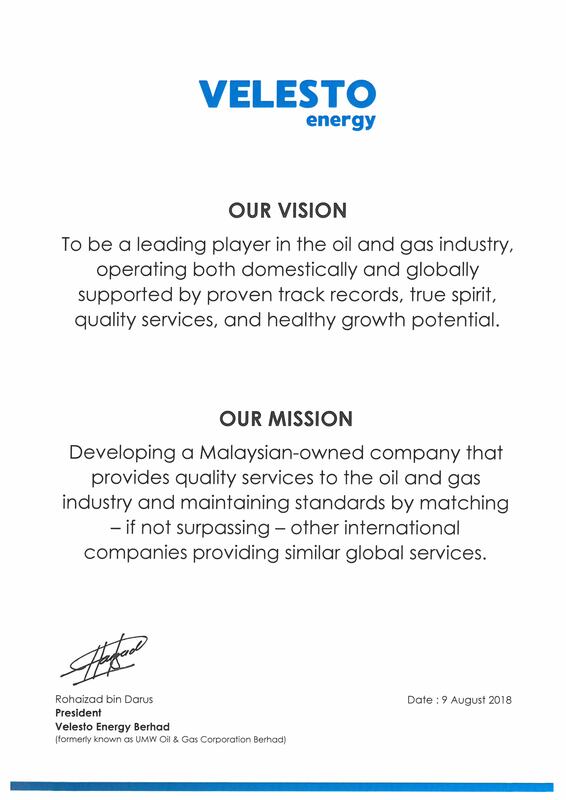 VELESTO ENERGY BERHAD (“VEB”) (formerly known as UMW Oil & Gas Corporation Berhad) is a Malaysia-based multinational provider of drilling for the upstream sector of the oil and gas industry. In our drilling services business, apart from our home base in Malaysia, we also have experience operating in other parts of South East Asia, providing drilling services for exploration, development and production wells with our fleet of offshore drilling rigs. Velesto Energy Berhad is also a provider of workover services through its fleet of hydraulic workover unit (HWUs). Velesto Energy Berhad is able to offer the services mentioned above through its impressive fleet which consists of seven (7) wholly owned premium jack-up drilling rigs (Naga 2, Naga 3, Naga 4, Naga 5, Naga 6, Naga 7 and Naga 8), and four (4) HWUs (Gait 1, Gait 2, Gait 5 and Gait 6). These rigs are designed to meet the recent demands of the industry. As such, with our drilling capabilities, Velesto Energy Berhad is able to bring top notch service and have a respectable international presence.